Location: Stepped down to right of the National Westminster Bank. 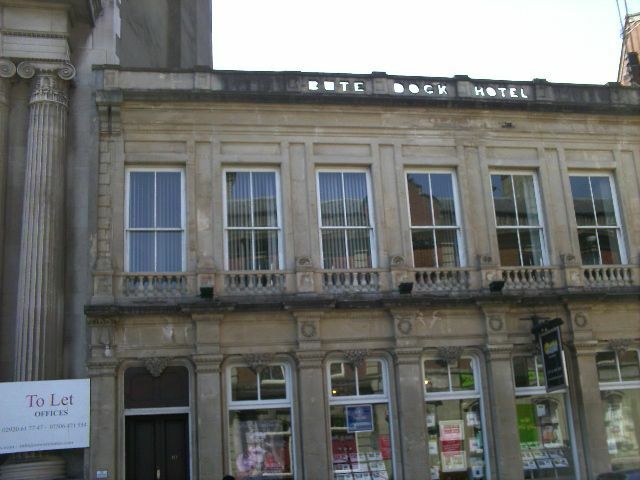 The Bute Dock Hotel was licensed in 1839; extended towards Bute Street in 1851 and with grander frontage added in later C19. Later became Docks Non-Political Club, before 1990s reconversion to Public House. Classical Bath stone front; 2-storeys, 7-bay front with distinctive balustraded aprons to 1st floor and pierced lettering to parapet. Slate roof and brick chimney stack. Cornice has paired end brackets over raised quoins. 1st floor architraves include panels over lintels; aprons have bulbous balusters and panelled piers with foliated caps between each bay. Later casement window added to centre. Ground floor punctuated by egg and dart capitalled pilasters together with stepped frieze and cornice; wreath ornament to central bays. Tall windows with hight transoms and rounded shoulders and unusual pendant-like festoons; also over double door entrances to either end; plinth band. Included for its pleasing late C19 frontage, and for group value with adjacent buildings. Stepped down to left of the National Westminster Bank near the entrance to Mount Stuart Square. Docks Non-Political Club to rear.